PICTURED: Macquarie Football’s Volunteers of the Month, Michael Sneesby and Kira Gleeson with two participants from the Edgeworth FC Arnett’s Program. 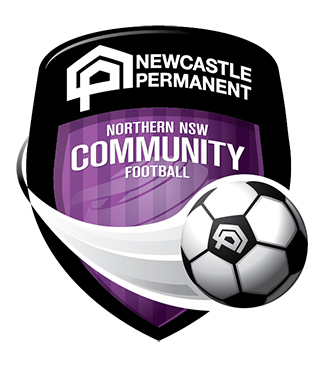 Northern NSW Football (NNSWF) is pleased to announce the Newcastle Permanent Volunteers of the Month for March 2018 across the zones. 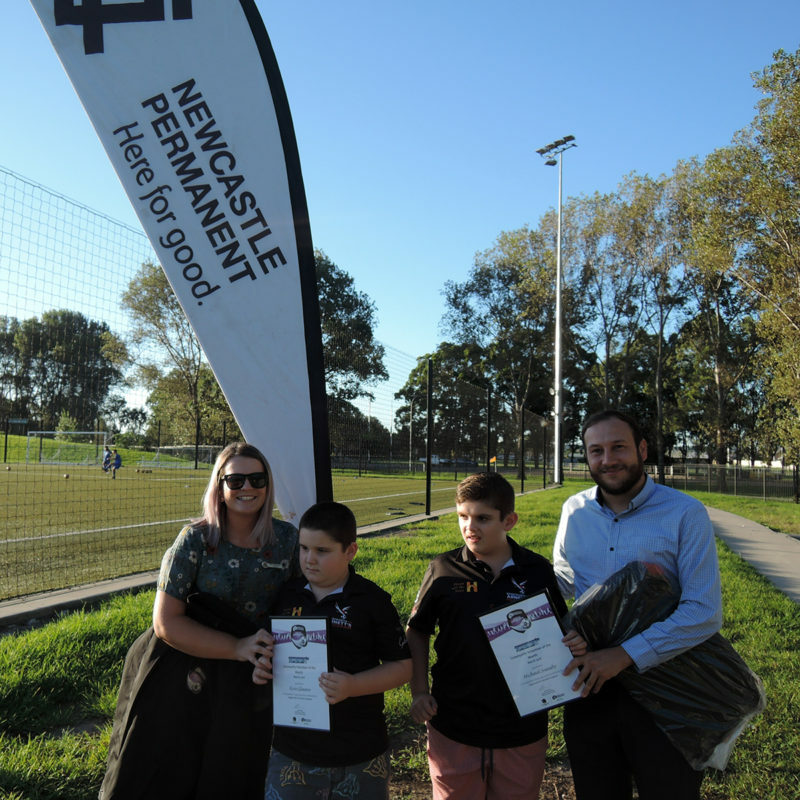 “Finding volunteers as passionate and selfless as this month’s winners is the goal for all clubs across the country regardless of the sport,” Community Football Manager, Peter Haynes said. 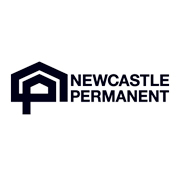 Newcastle Permanent Chief Executive Officer, Terry Millett echoes Haynes sentiments and applauds the volunteers who received the award. “Volunteers are the lifeblood of clubs and without their hard work games would not happen every weekend. 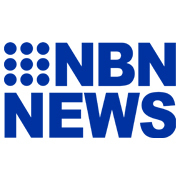 Our thanks goes to the thousands of volunteers across Northern NSW who give their time so generously and ensure players and spectators have a great experience on and off the field,” Millett said. 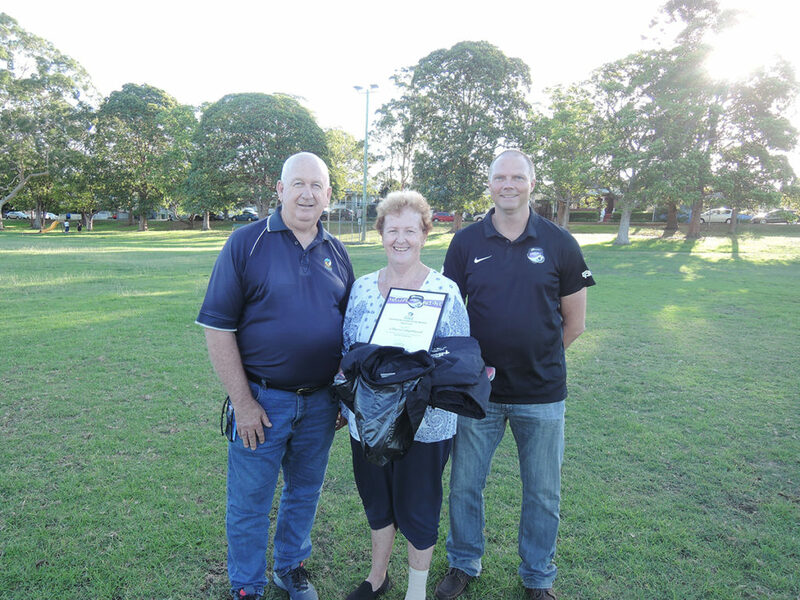 Sharon is the female participation officer at Mullumbimby Brunswick Valley Football Club. 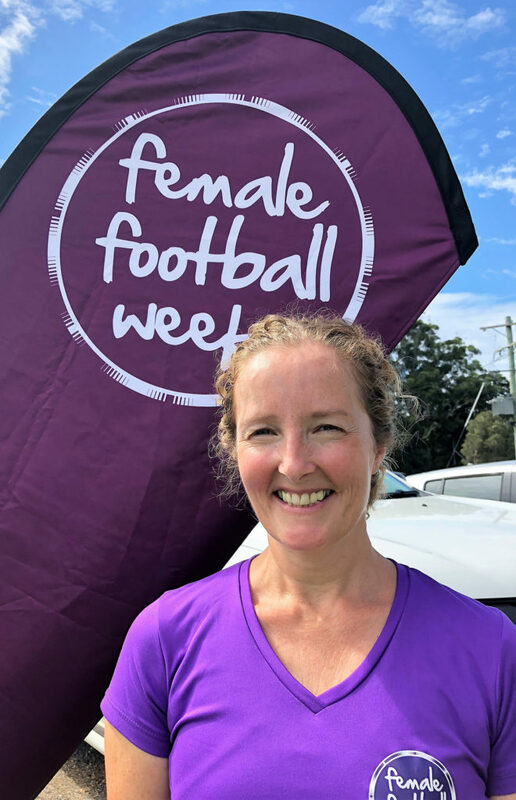 Multiple nominations received confirm how highly that Sharon is regarded and her passion for female football has seen a spike in female participation at the club. Sharon was instrumental to the recent very successful Female Football Gala Day that has the community very excited about the season ahead. Sharon is always the one to put up her hand to help organise and her infectious enthusiasm motivates other people to get involved. Sharon is described as, “fun and easy-going person to be around, always encouraging others to join in and have a go”. All who know Sharon say that she is an amazing advocate for women’s football. 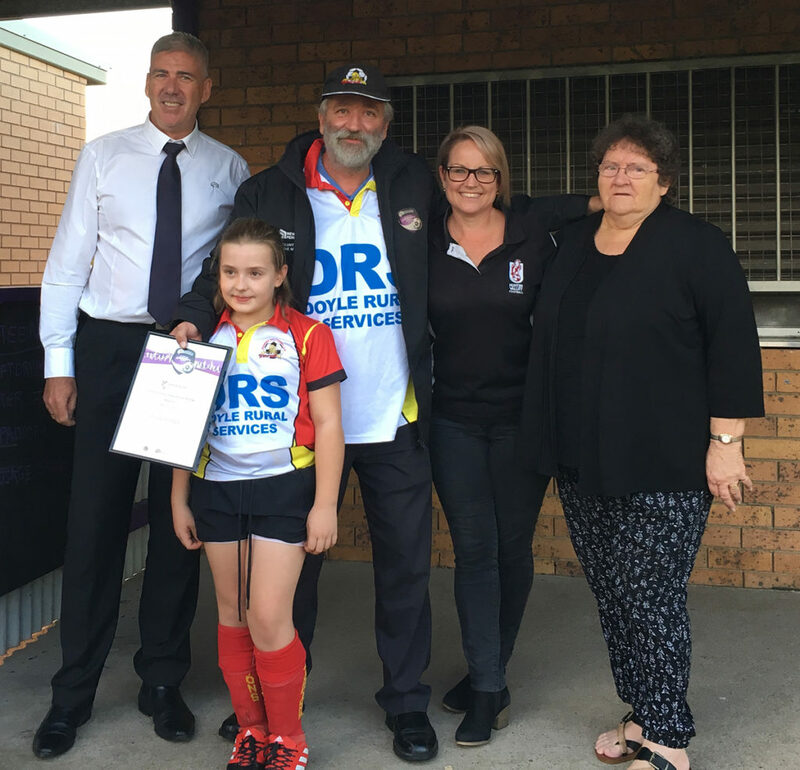 Doreen has given her time and dedication to volunteering as secretary/treasurer/uniforms co ordinaries for the South West Rocks Football Club for the past 20 years. If she wasn’t there the club wouldn’t maintain its operations. She is also the secretary and treasurer of the South West Rocks Sport and Recreation Association. Doreen spends her weekend making sure everything runs smoothly and enjoys taking photos of all the players to create wonderful memories. Doreen is a very much deserving person to receive such recognition. Fritz Woller is an incredibly valuable member of our football club. He performs his role as a secretary with absolute detail and thoroughness that we have come to rely on. He works tirelessly and many many hours both within the club and for the club in the broader community. In rural communities, activities such as soccer are an important forum to unite and socialise in a positive way. Fritz works tirelessly year after year to rally and enthuse both young and old to become apart of our football community. He also encourages, enthuses and inspires his fellow volunteers who work by his side.He has a genuine drive and passion to see kids connect on a social level and thrive and excel on the field. I am so grateful to volunteer with Fritz and would love to show this gratitude on behalf of our community and nominate him for being a wonderful volunteer. Michael and Kira have for over 12 months now volunteered there time two to three days per week to run the coaches and volunteers for the Edgeworth FC Arnett’s Program.  They utilise their training and skills as special ed teachers and sporting coaches to deliver a fantastic program to the children with special needs and disabilities, who play for the Arnett’s. They also coordinate all of the other volunteers who donate their time to Arnett’s, to ensure the children and their families have the support they need to enjoy their football experience. Michael and Kira have no children, relatives or any other ties to the Arnett’s, which is what makes their efforts so special, as they do all this work from the kindnesses of their hearts, just to help to special kids of the Arnett’s. Michael and Kira are the epitomai of what a volunteer truly is and they deserve this recognition, as a way of all of us at the Arnett’s showing what they mean to us and to say thank you. Shantell is the main hub of the Corindi community football club. The club and community would be lost without her! she is an amazingly caring, devoted and committed secretary, canteen manager and marketing/fundraising manager for Corindi red rock breakers club. She’s really one in a million. During the 2017 season, Cammy coordinated sponsorship from many different businesses houses around our local community to enable updating of many of the teams playing shirts. Cammy also coordinated the very effective distribution, collection and cleaning of 450+ playing shirts. Cammy consistently supports the Inverell FC in many different ways without any expectation of praise or acknowledgement. I am just a parent of a child who plays soccer on a Saturday morning – there is a high chance that Cammy does a lot more than what I have mentioned above to support this club!! Cheryl has been with us for 16 yrs. Even when her son stopped playing she remained at the club. She broke her foot 2 weeks ago but still is hobbling to muster days to assist players with their registrations. She also supports our new registrar and our fundraising coordinator above and beyond what her job description entails.